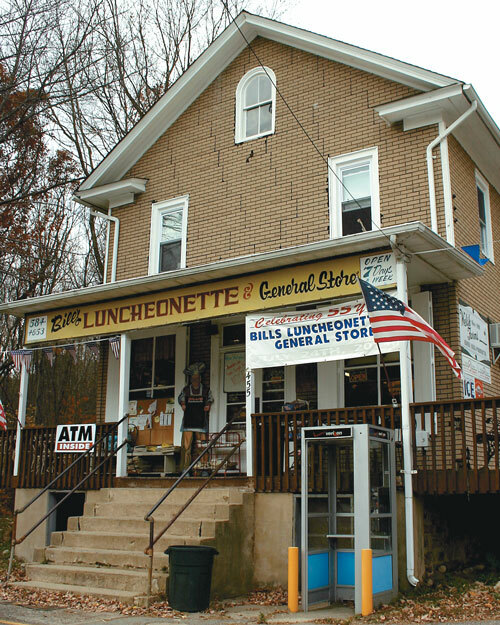 Bill’s Luncheonette (2004), the repository and symbol of Ironia’s heritage. 146 years ago, in 1871, a small section of Randolph Township was given a name, and an identity. It was born when the booming iron industry in Morris County was the third largest in the nation. Surrounded by several of the larger and most productive mines, in neighboring Chester, Mine Hill, and Port Oram (Wharton) this section of land drew the attention of several prominent local men. Soon, plans for developing a town out of this isolated woodland were formulated; a town christened, appropriately, "Ironia". It would be the "missing link" along the rich vein of ore that ran from the Dickerson Mine south into Chester. At the time of this conceptualized plan, there were about 50 dwellings in the surrounding area, mostly farmhouses, along with various gristmills, sawmills and distilleries. But there was no "downtown" as had developed in nearby Chester, Dover, or Succasunna. This was a rural area, where neighbors were miles apart, roadways barely passable, and self-sufficiency a requirement. The potential for prolific and profitable mines within Ironia did exist. In 1828 the first mining operations began in the Comb's Hollow section, and over the next sixty years about twelve mines were worked. None of the mines, however, proved productive enough to warrant railroad extensions, and families, rather than mining companies, operated most of them. Daniel Budd and Nathaniel Cooper were two prominent Chester citizens who lobbied for the railroads to come to Chester and connect to the mines further north. The line was opened in 1869, passing along the Black River and through the land upon which Ironia would be developed. Budd joined forces with the Canfields, owners of the Dickerson Mine, and several others to embark upon a three-tiered project to create an industrial town out of this area of wilderness and scattered farmland. The Ironia Iron Company was to develop future railroads needed to access area mines. The Ironia Car and Transportation Company was to manufacture train engines and cars. And the cornerstone of the project, the Ironia Land and Improvement Company, acquired rights to purchase up to 1,000 acres of land in the vicinity of the railroad for the development of a planned community based around the iron industry. A grid of grand paper streets, only a few of which were ultimately constructed, described 50X150 lots which were to be sold along the streets nearest the railroad tracks. And four furnaces, along with the already existing Thorpe's sawmill, were to harness the waterpower from Bryant's Pond to provide the needed materials for the Car and Transportation Company and the Iron Company. Not a trace of the hotel and general store, shown at top in 1902, remain at the Patriot’s Path trailhead (below) at the end of Ironia’s Main Street. Main Street, Budd Street, and Chester Avenue were the names given to the roads that were to have anchored the town of Ironia. 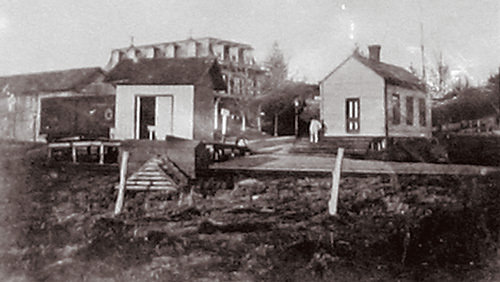 Main Street led to the depot, where a large 14x22 foot station was built. A three-story hotel was constructed here as well, along with a general store and a freight building. Along Budd Street and Chester Ave, three homes were constructed to house mining families. But no more were built, despite the grand scheme of the Ironia Land Company. In 1873, the country went through an economic downturn and the iron industry suffered. Financing and developing a town based entirely around iron mining now became a risk and the Ironia companies folded. The Land Company sold its accumulated property, and Ironia never materialized into the industrial hub it was envisioned to be. Although several of the larger Ironia-area mining operations were able to continue production for another decade the small Ironia mines could not recover, and their ore was left untapped. Hacklebarney, in Chester, stopped production by the turn of the century. The largest mines, such as the Dickerson and Scrub Oaks Mines in Mine Hill, continued operating until the mid-1900s. Upon the dissolution of the Ironia Land Company, Dorastus Bryant, who owned a mine, as well as a cider mill and distillery on the Turnpike road from Morristown (Sussex Turnpike), acquired much of the company's land holdings. He farmed the land, planting apple and peach trees. Bryant developed Park Avenue, which leads from Upper Ironia down the incline and over Bryant's Pond, and into Lower Ironia, in the 1880's. He apparently felt that it was a more advantageous route down to his property holdings than the original roadway. A schoolhouse, circa 1903, was located on Park Avenue, sharing a lot with the Ironia Presbyterian Church, built in 1907. The grandson of Dorastus Bryant at one time operated a milk processing plant across from the pond. And the Bryants' Evergreen Park House, which accepted boarders, was the genesis of a tourist trade. Evidence of tourism in Ironia continued into the mid-1900s. Greenhut Park, located down Pleasant Hill Road along the Black River, just before the boundary with Chester Township, was a summer colony that operated until the 1970s. Greenhut Park boasted its own hotel, the Peggy Lee, which had a large dance and recreation hall. Along the border with Mendham, off of Ironia Road, was the Polish Solkol camp. In the 1930s the Woodland Club nudist colony operated until the days of going naked ended in the 1960s, when early housing developments came too close for comfort. The Woodland Club is now a sportsman's organization. Although the railroad was meant to serve the now-defunct iron mining industry, it continued to play apart in the development of Ironia. The Chester Railroad, a branch of the Morris and Essex line, offered passenger service as well as the freight line. Ironia children utilized the train to attend classes in Dover. The train ran from Chester and stopped in Horton, Ironia, Succasunna, McCainsville (Kenvil), Port Oram (Wharton), and Dover. Connecting trains into New York City were available. The last Chester Railroad passenger train left Ironia on December 31, 1932. The last freight soon followed. The railway was officially abandoned in December, 1933, and the track dismantled. Farmland, woods, and a handful of tourist resorts characterized Ironia until the 1970s. The Crowley family had a large milk goat farm. Wally Wrede's River Game Farm had about 20,000 pheasants, and was in operation until the 1980s. The Manning farm, where the very important Almatong Wells are located, was sold to the Morris County Municipal Utilities Authority. These lands supply water to thousands of residents in Randolph and nearby townships. There was the Merrimac Turkey Farm off of Dover-Chester Road, in operation from 1952 until the mid-1970s. The Messer farm on Doby Road and the Hollander farm on Park Avenue are now day camps. Part of the Bryant complex at the intersection of Park Avenue and Sussex Turnpike became the home of the Westinghouse Elevator plant in the mid-1950s. Dairy farming was prevalent here until recently. The Cramer family operated a dairy along Ironia Road, which was known as the Mt. Heist Dairy. Approximately a half-dozen dairy farms were still in operation around 1970. 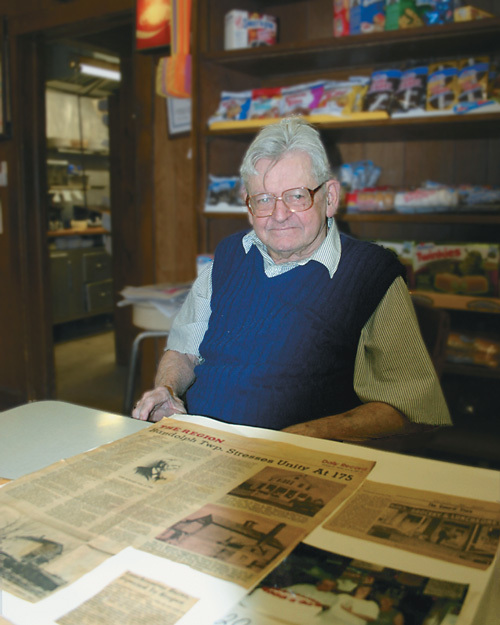 Before his passing in 2006, Bill Crowley (here seated at his general store), wrote a small booklet, entitled “Bill Crowley Recalls Stories of Old Ironia”, available for purchase at the store, and is highly recommended for anyone interested in Ironia's past. The names of the early Ironia families, as well as the later farmers, are reflected in many of the street names. Yet Ironia's heritage- both that of the railroad and iron industry that gave Ironia its name, and the tourism and farming industries which sustained it well into the twentieth century, is disappearing. Its most lasting monument has proven to be Stryker's store, now Bill's Luncheonette, which has presided over Ironia since 1860, from its vantage point just over the border in Chester Township on Route 513, also known here as Dover-Chester Road. In the early days, a forge and a blacksmith shop, located across the side street from the store, and a handful of houses were clustered here, and became known as "Upper Ironia". The road between the store and the forge led down to the railroad depot and the planned town, connecting the roads to Chester and Mendham with Ironia. The store has served as a Sears and Roebuck outlet, the post office, a stop for travelers passing through to Chester or Dover, and a meeting place for local residents. The Crowley family settled in Ironia, on their Breezy Hill goat farm, in the 1940s. They purchased the general store from the Strykers, and became Postmasters. Bill Crowley worked as Postmaster from 1944 ­ 1982, served on the original Ironia Fire Department from its inception in 1947 until the 1960s, and owned of Bill's Luncheonette and General Store from 1949 until his death in 2006. The general store retains much of the character of a store from a by-gone era. Many old photographs of Ironia are displayed here along with many other interesting items in this 140 year-old building. You can buy newspapers, milk, snacks, toiletries, and other necessities, and the grill is always on, with seating for about 50. The store has been a gathering place for locals and travelers alike, and remains so today. But there have been changes. Bill stated that "all people, from all walks of life" visit the store. Now, most come in for a quick cup of coffee in the morning and to pick up milk after work. It used to be more of a gathering place, he admits. "A lot of these (new) people don't even know we are here," he states. Unlike the recent past, when the store was the meeting place for all residents, newcomers and natives alike, the changing face of the Ironia population, and its growth, is reflected in the store's clientele. But Bill can be found there almost every afternoon. In "Lower Ironia", Main Street still exists today. It is a small residential roadway to nowhere... unless one is familiar with the history. 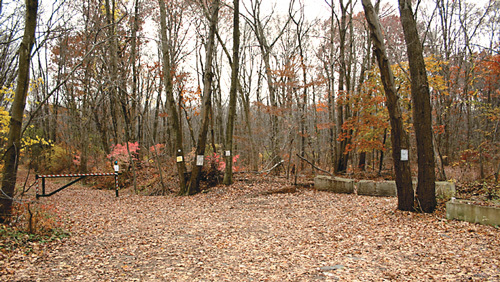 Today, the former railroad bed, from the location of the Ironia station and through to the Chester station, is part of the Morris County Park System's Patriot's Path. Additional trails connect through the Black River Wildlife Management Area and up to Bill's General Store. This is hunting land, and hikers must take precautions. • At 1547 Sussex Turnpike, near the Park Avenue intersection, the banked stone and frame structure known as D.L. Bryant Distillery, was begun in 1809. In 1869 it was remodeled and was soon famous as the home of “Bryant's Pure Old Cider Brandy”, locally renowned applejack. In 1938, the distillery was remodeled into a residence. • One of the few Ironia Land and Development Company Homes that was actually built around 1872 on Budd Street. • Community Church, built on Park Avenue in 1907. • Golden Corner House, Ironia’s oldest house, built in 1826 on the corner of Pleasant Hill Road and Route 513. In addition, the Combs Hollow Historic District is at the intersection of Combs Avenue and Combs Hollow Road.